Samuel finally knows that God is calling him as he sleeps. HE HIGH-PRIEST ELI had two sons, named Hophni and Phinehas, who were both priests. But they were exceedingly wicked men; and when the people who came to worship complained to Eli of the wickedness of the young men, he reproved them so gently that they gave no heed to what he said. And God was displeased with him for not using his authority to make them do better. One night, when Samuel was laid down to sleep, he heard a voice calling him; and thinking it was Eli, he got up and ran to him, to know what he wanted with him. But Eli bade him lie down again, for he had not called him. 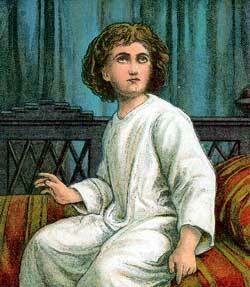 Again the voice called "Samuel," and again Samuel ran to Eli, who told him he had not called. But the third time that Samuel heard the voice, and ran to Eli thinking it was he, Eli became aware that it was God Himself who was calling to the child. So he bade him go and lie down again, and if the voice called him once more, to answer, "Speak, Lord, for thy servant heareth." Then, when he was laid down again, the voice called as before, "Samuel, Samuel." And when Samuel answered as Eli had bidden him, God told him that he was going to punish Eli and his sons in a fearful manner, because the sons had made themselves hated for their wickedness and profanity, and Eli had not prevented it as he ought to have done. In the morning Samuel rose, and, as was his office, opened the doors of the Temple. But he did not tell Eli what God had said to him in the night: he was afraid of doing so, it was so very sad. Eli, however, bade him come to him and tell him all. And when the poor old man knew that it was God's will to destroy him and his family, he would not murmur at it: he only said, "It is the Lord, let Him do what seemeth Him good." Very soon after this the Israelites were fighting against the Philistines, and thinking they should be sure of victory if the ark of God were with them, they fetched it into their camp from Shiloh. But for their sins God suffered them to be defeated; the ark was taken, and Hophni and Phinehas, together with thirty thousand of the Israelites, were slain. Poor old Eli meanwhile sat by the wayside, waiting for tidings of the battle. And when word was brought him that his sons were killed and the ark taken, he fell of his seat backward, and broke his neck. Some time after Eli's death, Samuel judged Israel in his place.